Tumeric (known as olena in Hawaiian) is well known as a culinary herb and important ingredient in traditional healer's medical kit. (That includes mom's kitchen) Curcumin's healing properties are renowned and shared by many cultures. Here is a wonderful use of tumeric as traditionally used in India, includes an easy to prepare recipe and don't miss the scientific reasons why the black peppercorn is added. Turmeric is an ubiquitous indian spice and a common ingredient of pre-mixed curry or masala powders. Turmeric (haldi, Konkani; haridra, Sanskrit) is also an essential component of fish marinade. While I take for granted the turmeric used in cooking, I distinctly remember my grandma preparing scalding hot, turmeric milk whenever we had a sore throat or cold. And grandma admonished us to sip it hot, letting it course its way down the back of our throats. Haaiiii! She had alchemized this common root, to a piping hot, golden elixir, which not only got us back to school the next day (unfortunately), but also back on the playground (v good). Something magical about that turmeric milk! If she only knew! A few months ago when experimenting in the kitchen I had cut my palm. Having seen my aunts and mother for ages in the kitchen, I instinctively reached for the turmeric powder and dabbed it in the cut stanching the blood and forming a clot. Now scientists tell us that turmeric is anti-bacterial – preventing infection and also helping heal the wound! Curcumin, the active ingredient in turmeric is responsible for its medicinal activity and pigmentation. Ensconced in multimillion dollar laboratories, western scientists are slowly catching up to what our grandmothers, armed with stone mortar and pestles have known for millennia. Something magical about that turmeric! Scientists now tell us that curcumin is anti-inflammatory, in that it can reduce soreness and fever, much like tylenol or paracetamol. And it acts like those latest anti-inflammatory drugs called cox-2 inhibitors: Celecoxib and Vioxx. Both of these medicines have serious side effects and vioxx has been withdrawn by the FDA for safety reasons. On the other hand, turmeric as a dietary constituent is safe and well tolerated! Without turning this into a scientific review paper, I hope you are convinced that turmeric is really good for you. 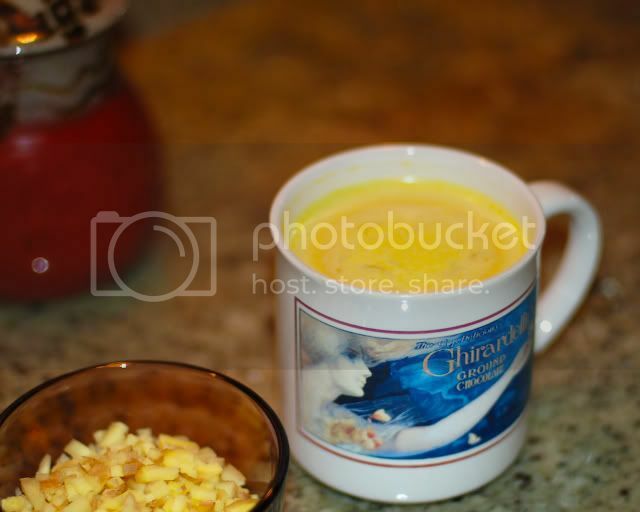 Daily consumption of dietary turmeric in the form of added spices, or this turmeric milk can have near magical properties. No wonder that in Hindu pujas, devas (Gods as crude approximation) and young brides are doused in turmeric powder! 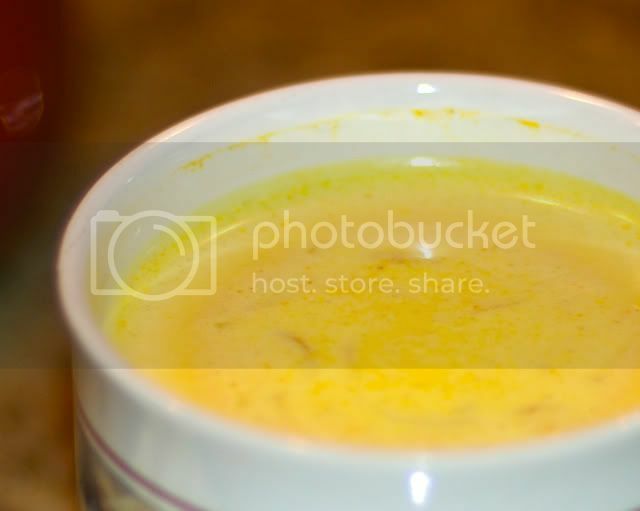 Here is a really simple recipe for the magical turmeric milk (haldi dudh, in konkani). At the first signs of a sore throat, or feverishness, sip this hot milk drink and call it a night! Wake up fresh and ready to take on the world! When you do try this recipe, I’d love to hear your experience. Note: Ginger (adrak, Sanskrit) used in this recipe is well recognized in Ayurvedic and western medicine as having anti-inflammatory and anti-cancer properties. It is widely used to prevent motion sickness, to prevent nausea and most importantly suppresses cough. More on that in another recipe. Top off with milk. You can also skip the milk and do this in water! Off to bed! Awake refreshed and energized! Update: Scientists have demonstrated that when curcumin is ingested along with a peppercorn extract, the ability of our body to absorb and utilize curcumin increases dramatically, upto 2000%. Thus the indian tradition of including peppercorn in this home remedy (as commented by readers) has a basis in science as well.